47th Bud Light SCORE Baja 500 Round 3 of five-race 2015 SCORE World Desert Championship June 6-7—Ensenada, Baja California, Mexico—510.58 miles Total Sta... See More . . . The Baja 500 crowds packed this year's Contingency area for the opportunity to see and interact with their favorite teams and drivers while checking out the Con... See More . . .
GREENVILLE, S.C. (June 5, 2015) – Leading motorsports and events company and race tire distributor, Jackson Motorsports Group (JMG), is proud to launch the BFGoodrich® Baja T/A® KR2 UTV tire at the 47th Annual Bud Light SCORE Baja 500 in Baja Califor... See More . . . SCORE MEDIA CONTACT: Dominic Clark, dominiccnv@aol.com June 4, 2015 Race to air on CBS Sports Network Huerta Jr, R. Wilson, S. Reid top three qualifi... See More . . . SCORE MEDIA CONTACT: Dominic Clark, dominiccnv@aol.com June 2, 2015 EDITOR'S NOTE: Following is the expanded entry list for Saturday's 47th annual Bud Lig... See More . . .
Race to air on CBS Sports Network Round 3 of five-race 2015 SCORE World Desert Championship being held in Ensenada, Mexico Entries from 26 U.S. states, 10 countries celebrating SCORE’s 42nd anniversary; Riviera del Pacific Cult... See More . 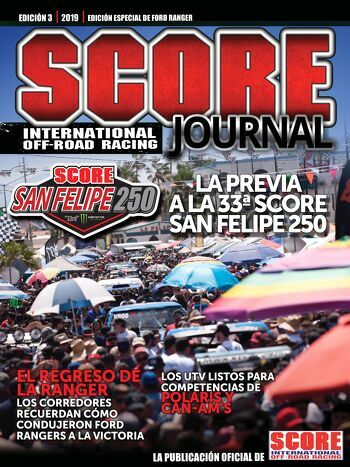 . .
May 31, 2015 SCORE’s Oscar Ramos J. cancer treatments progressing favorably in Mexico City hospital RENO, Nev. – SCORE International desert racing official... See More . . .
JTNDc2NyaXB0JTIwc3JjJTNEJTI3JTJGJTJGd3d3LnZvb3BsYXllci5jb20lMkZ2MyUyRndhdGNoJTJGdmlkZW8uanMlMjclM0UlM0MlMkZzY3JpcHQlM0UlM0NpZnJhbWUlMjBpZCUzRCUyN3Zvb3BsYXllcmZy... See More . . .
OFFICIAL SCORE CBS Sports Network Promo Video for the Bud Light SCORE Baja Sur 500 Race Broadcast is HERE! Awesome Video – watch and SHARE! Mark your calendars and set your DVRs for Sunday, May 31st @ 9 p.m. ET / 6 p.m. PT – with a repeat airing on Sunday, June 7th @ 9 p.m. ET / 6 p.m. PT. Are You Ready?... See More . . . SCORE MARKETING & SALES CONTACT: Jim Ryan, Jim@SCORE-International.com SCORE MEDIA CONTACT: Dominic Clark, dominiccnv@aol.com May 29, 2015 Featuring in dep... See More . . .